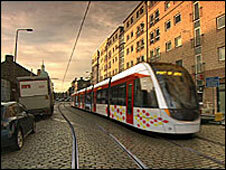 A key part of Edinburgh's £500m trams project will be delivered at least one year late. The two year project to divert utility pipes and cables along the route was supposed to be finished six months ago. Project manager Tie has confirmed up to a third of the work still needs to be completed. But they claimed it would be done by the end of the summer. SNP MSP Shirley Anne Somerville said she was worried some parts of the route may be scrapped if it runs over budget. Pipes and cables are being moved before the tram tracks are laid so that they can be easily accessed by workmen if they need to be repaired. Ms Somerville has revealed that 30% of the tram project's utility diversion (MUDFA) works are not yet completed, despite this phase of the project being scheduled to be finished in September. The information on MUDFA progress was provided by Tie in response to one of a number of Freedom of Information requests from Ms Somerville. The section from Newhaven to the bottom of Leith Walk is the furthest behind schedule, with only 39% of work finished. Ms Somerville said: "This tram scheme has gone from fiasco to farce. With 30% of utility works still to be done at this stage, I am extremely concerned that the project's finances are completely off the rails. "Despite continuous denials from Tie that there was anything other than minor delays, it was clear to everyone suffering the chaos that they were seriously behind schedule - we just didn't know quite how far behind. "The lack of progress between Newhaven and Leith is particularly worrying. It raises suspicions that this section may be set to be scrapped if the costs continue to spiral." Steven Bell, project director of Edinburgh Tram Project, said: "Any delays associated with these works have been regularly and widely communicated to the local business community and residents in the affected areas. "I'm pleased to confirm that the outstanding utility work will be completed progressively during the summer. "The technical challenges in some areas of the tram route, including the removal of a 150-year-old gas main and the discovery of 300-year-old bodies, have unfortunately had an impact on the programme."